Product information "HI98103 Checker® pH Tester with 0.1 pH Resolution"
The pH Checker® series supplies users with fast and accurate readings from 0 to 14 pH with a resolution of 0.01 pH. This compact pH meter features an easy-to-read LCD and simple to perform two-point calibration. The pH electrode of the Checker can be easily replaced. You only need to unscrew the electrode from the meter body and screw on a new one. The Checker® is fast, accurate, lightweight and with 3000 hours of battery life, you no longer have to worry about frequent battery replacement. 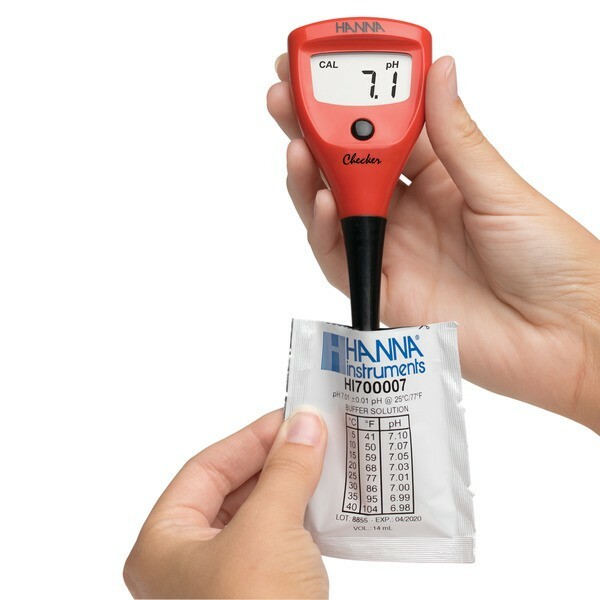 The pH Checker® series supplies users with fast and accurate readings from 0 to 14 pH with a resolution of 0.01 pH. This compact pH meter features an easy-to-read LCD and simple to perform two-point calibration. The pH electrode of the Checker® can be easily replaced. You only need to unscrew the electrode from the meter body and screw on a new one. The Checker® is fast, accurate, lightweight and with 3000 hours of battery life, you no longer have to worry about frequent battery replacement. HI98103 (Checker®) is supplied with HI1270 pH electrode, batteries and instructions. Related links to "HI98103 Checker® pH Tester with 0.1 pH Resolution"
Customer evaluation for "HI98103 Checker® pH Tester with 0.1 pH Resolution"